The mineralisation at Forio is very significant as it is located in a dilational zone to the north west of the Tollu Fault, which is in a different location to the previously discovered mineralisation. Its current strike length remains open in all directions and as yet has not been effectively drilled out below 50m. The most recent drill results disclose the widest and strongest copper mineralisation discovered at this depth to date at Tollu. The identification of additional “Forio look-alike” prospects is seen as a significant bonus in addition to the maiden JORC compliant Mineral Resource achieved by the 2015 drilling campaign. There is undoubtedly excellent potential to significantly expand the Mineral Resource with future drilling, both to extend the mineralisation in the near-surface, open pittable environment as well as targeting extensions of the higher grade sections of mineralisation. As a result Redstone has revised its targeting strategy. Consequently it has reprioritised its existing exploration prospects and defined new prospects with the information gathered from its most recent drilling campaign. 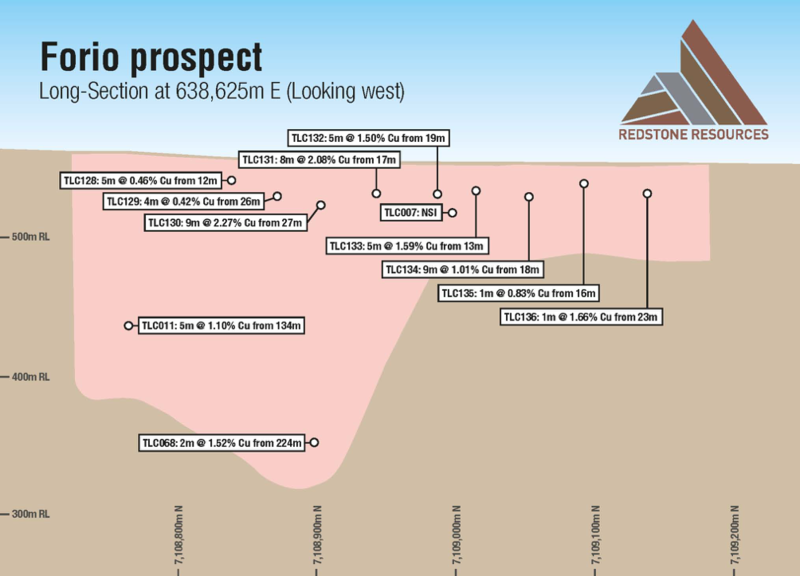 Following from the most recent drilling program Redstone has identified a further five (5) “Forio look-alike” prospects and three (3) previously identified prospects within the area to the east of the main North-South structures. The new Forio look-alike prospects include; Huntington, Drummond, Stourhead, Exbury, and Forio South combined with the previously identified prospects of Kilruddery, Bodnant and Prater Prospects (Figure 2). A further two new Prospects to the west of Main Reef have also been identified, being the Isola and Butchart Prospects (Figure 2). These prospects have been identified after a full data review from the success of the drilling at the Forio Prospect with the Kilruddery and Bodnant Prospects being reprioritised for further drilling. The additional Forio look-alike prospects and increased Conceptual Exploration Target are important to the economics of the Project. They provide a solid foundation to significantly expand both the copper oxide material at the Tollu Project and the Mineral Resource. The Kilruddery Prospect is a series of sub vertical hydrothermal bodies exposed at the surface. This prospect forms part of the dilation system running parallel to Forio. The Bodnant Prospect is a series of sub vertical hydrothermal bodies exposed at the surface. This prospect forms part of the dilation system running parallel to Forio. The Forio South Prospect is a series of sub vertical hydrothermal bodies identified from Redstone geophysics data. This prospect forms part of the dilation system running south of Forio. The Huntington Prospect is a series of sub vertical hydrothermal bodies exposed at the surface. This prospect forms part of the dilation system running parallel to Forio. The Drummond Prospect is a series of sub vertical hydrothermal bodies exposed at the surface. This prospect forms part of the dilation system running parallel to Forio. The Stourhead Prospect is a series of sub vertical hydrothermal bodies exposed at the surface and identified as a priority EM Target. This prospect forms part of the dilation system running parallel to Forio. The Exbury Prospect is a series of sub vertical hydrothermal bodies identified from Redstone geophysics data as a priority EM Target. This prospect forms part of the dilation system running parallel to Forio. Atlas Project (prospective for IOCG & Mt Isa style-copper sediment-hosted). 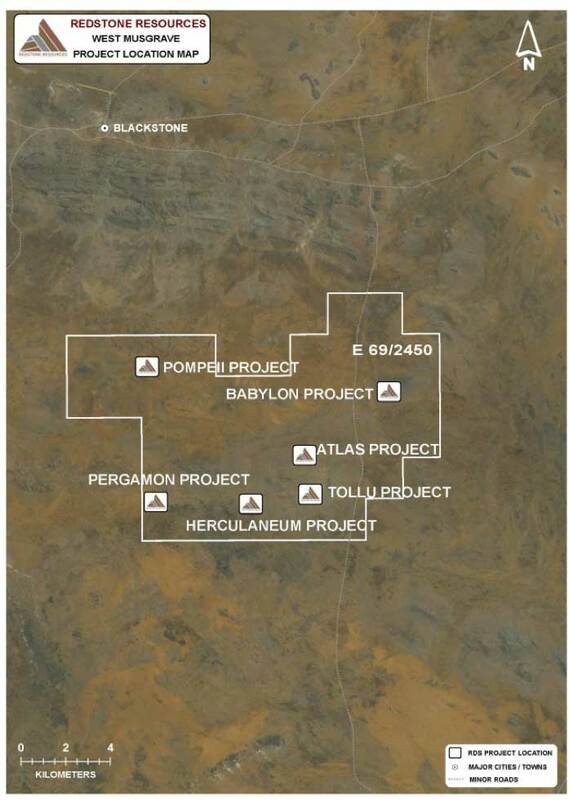 Babylon Project (prospective for IOCG & Mt Isa style-copper sediment-hosted). Pompeii Project (prospective for Mt Isa style-copper sediment-hosted). Pergamon Project (prospective for Mt Isa style-copper sediment-hosted). Herculaneum Project (prospective for Mt Isa style-copper sediment-hosted).